After a fantastic trip in 2018, we're going back for more! This time, we've extended the retreat to allow for more space and more opportunity to soak up the benefits of rediscovery of yourself and time to do what you love. This 7 day retreat is an opportunity for you to grow, create internal space and discover new insights. You can expect to experience a deep sense of relaxation and renewal, clarity of mind and a renewed sense of purpose and direction. 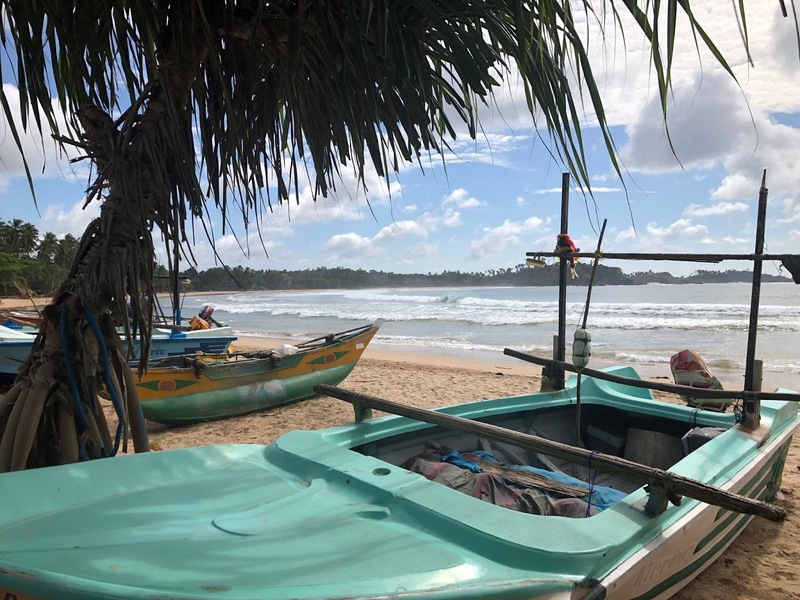 Set on the beaches of southern Sri Lanka, this beach-side retreat allows for time to rest and relax or adventure, surf or fun.... your choice! Escape and return to your true self. Return home with more peace, passion and purpose. ** UAS$300 deposit required to secure your spot. All levels of experience are welcome. 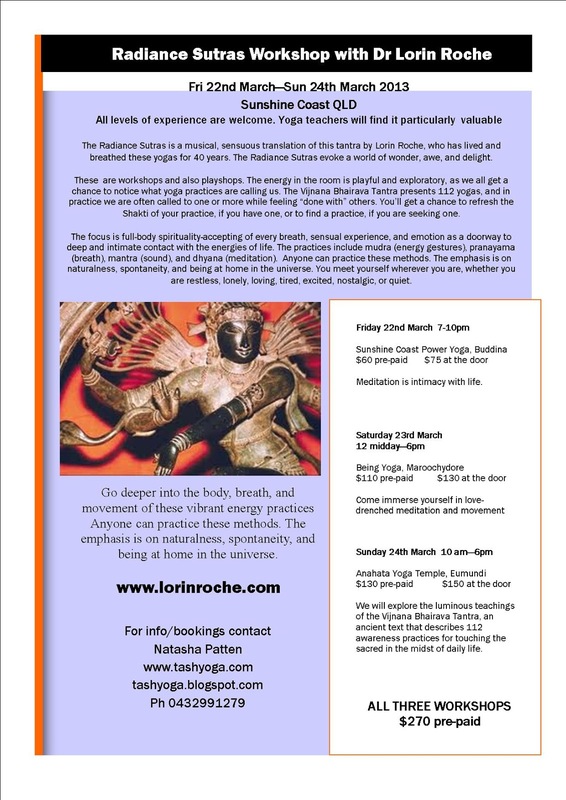 If you have a desire to learn meditation practices that suit your individuality and your inner nature, you are welcome. This workshop is also, as an option, certification hours for those wanting to improve their skills at teaching meditation. Meditation is one of life’s great pleasures, a vacation in the vibrant present. There are hundreds of meditation techniques, and, when you find the style that fits your inner nature, meditation feels like the most natural thing in the world. 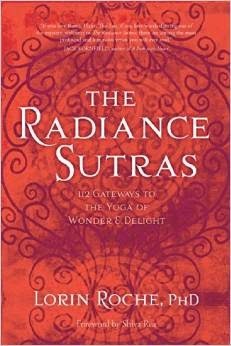 This retreat explores the luminous teachings of The Radiance Sutras, Lorin Roche’s new translation of the Vijnana Bhairava Tantra, an ancient yoga text that describes 112 meditation practices for touching the sacred in daily life. The teachings are playful, instinctive, down-to-earth, and transcendent. This is an exclusive, intimate retreat with strickly limited numbers. 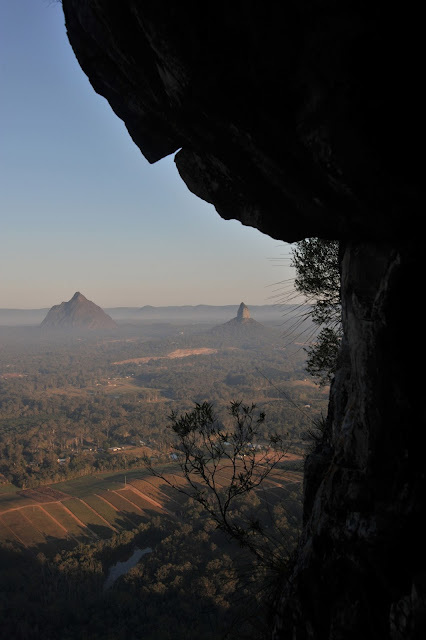 Set in the beautiful surroundings of The Glasshouse Mountains on The Sunshine Coast, the accomodation is eco-freindly, peaceful and relaxing. Meet yourself where you are in a retreat that emphasizes naturalness, spontaneity, and being at home in the universe. Techniques to blend meditation and movement. Note –– For those interested in the Yoga Alliance accredited meditation teacher training, there will be extended hours. This counts as 25 hours of teacher training (contact and non-contact hours). For further information, visit meditationtt.com. In order to secure your space please pay a deposit of $155. Delux: $AU1580.00 $2400 for two people sharing. Basic rooms = private room but may have share bathroom with one other person. # All meals are catered by in-house chef. 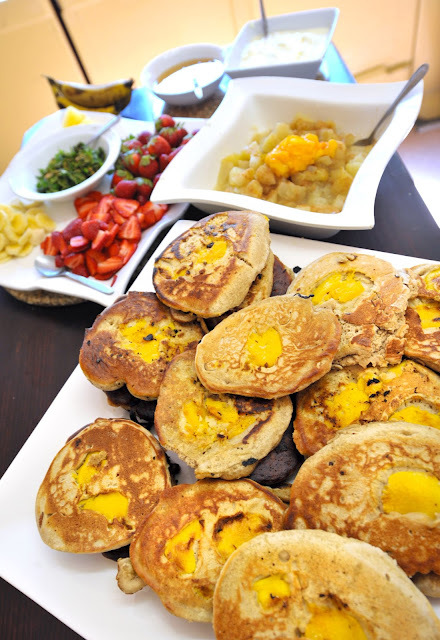 Delicious, nutritious meals, using organic/local/spray-free produce. All dietry requirements are catered to. This is an exclusive, intimate retreat with strickly limited numbers. A non-refundable deposit of $155 must be paid to secure your booking. No refund for cancellation with 48hrs of event. Full refund (minus deposit) for cancellation of 2 weeks or more notice. Set on the beaches of southern Sri Lanka, this luxurious retreat gives you plenty of opportunity to relax and create internal space. Enjoy daily yoga and instinctive meditation classes, a values-setting workshop to keep you moving towards your best self ever and develop steps to living a life that is deeply fulfilling. Enjoy healthy fresh organic cuisine, massage and spa treatments *, surf-beaches, optional surf-lessons, freshwater lap pool, exotic adventures and feast your senses in an optional cooking class.Escape and return to your true self. Return home.Resest your inner self and return home with more peace, passion and purpose. 5. Enjoy the experience of a lifetime! * A range of massage and beauty treatments are available at The Resort Spa. Services include Massage, Reflexology, Facial-treatments, Body Scrubs and wraps, Ayurvedic Massage, manicure and pedicures. Prices are very reasonable ( Ranging from US$25-US$50) and discounted 3 and 5 day packages are available. balcony, reading desk and ceiling fans. 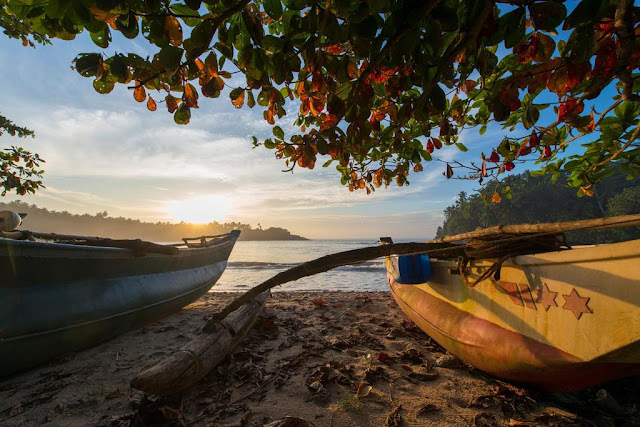 Listen to the sound of waves in the distance, hear the monkeys playing in the trees and understand what being connected to nature is all about. 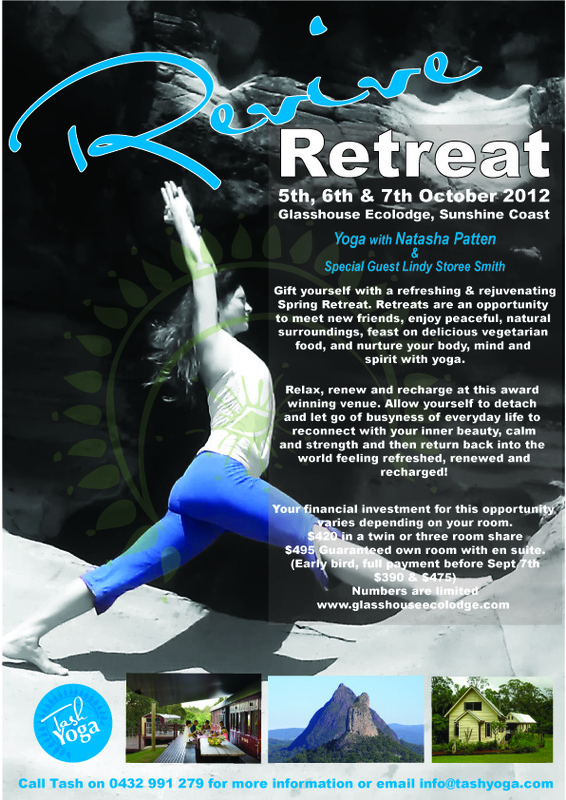 PLEASE NOTE THAT A 20% DEPOSIT IS REQUIRED TO BOOK YOUR YOGA RETREAT. If cancelation is before June 15th, deposit will be refunded. If cancelation is after June 15th, no refund given. 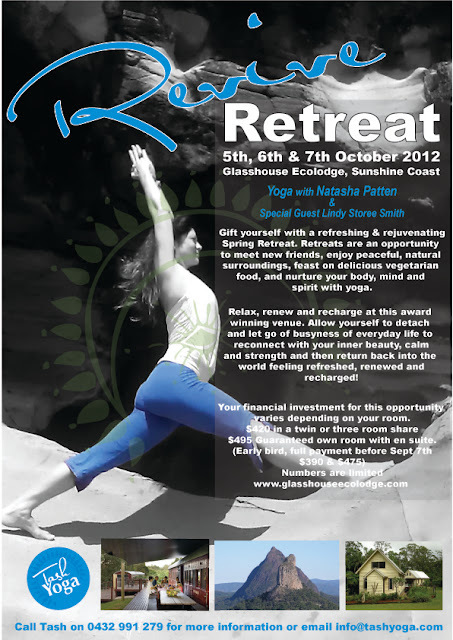 PLEASE NOTE THAT A 20% DEPOSIT IS REQUIRED TO BOOK YOUR YOGA RETREAT. Full Payment required by August 23rd. Invite more passion, peace and purpose into your life. 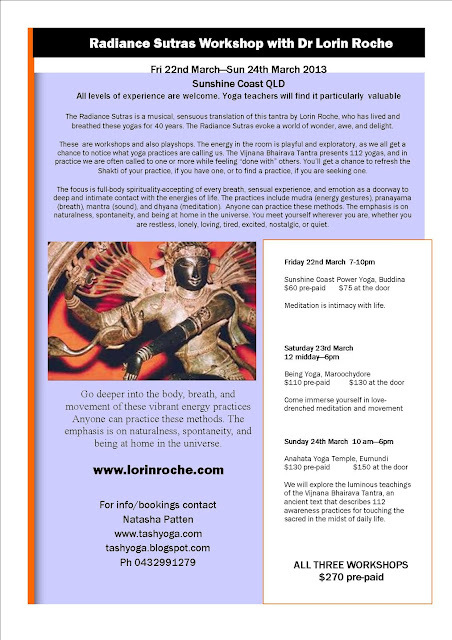 Learn to customise your inner yoga, your meditation practice to suit your unique inner ecology. Let this be the most natural thing in the world, an extension of your exploration of your life in the world. Learn the skills to cultivate a healthy meditation practice and dissolve the accumulative signs of stress in your mind-body system. In this busy world of overwhelming responsibilities, uncertainties and eternal to-do lists, let your meditation practice be a sanctuary where you can just be yourself, renew and refresh. Standard: $AU1210.00 $2100 for two people sharing Only two left at this price! Delux: $AU1570.00 $2400 for two people sharing. * Dorm-style rooms = share room with one or two other people. Basic rooms = one room but may have share bathroom with one other person. Delux = delux queen , spacious, private ensuite. In these wildly challenging times, having a daily meditative practice is one of the best forms of self-care, deeply healing and nourishing. Your meditation time is a sanctuary from the world, a space and time where you can come home to yourself, come home to your body and heart, come home to your place in the universe.In order to get the greatest physical, emotional, and spiritual benefits of meditation, you must find the ways that suit your nature. That is why women need their own approach, one that supports the female body and psyche. On this retreat you will discover Indonesia's emerging jewel, Lombok . 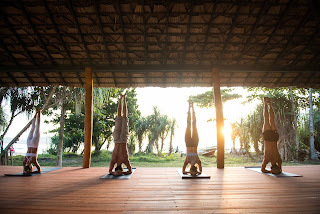 Surf world class breaks, relax on pristine white sand beaches with exquisite turquoise waters, explore rugged coastline and jutting headlands, enjoy traditional massage,and immerse yourself in yoga, meditation and nature. 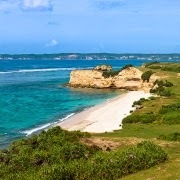 Blessed with exquisite white-sand beaches, epic surf, a lush forested interior, and hiking trails through tobacco and rice fields, Lombok is fully loaded with equitorial allure. In between yoga, surfing, massage and meditation you can escape to your architect-designed chalet made of natural timbers and grass roof or sit by the infinity pool with in-pool bar overlooking the beach. The resort is a place to come to if you want to really feel the environment seep into your heart and soul, with food, facilities and fun. This eco-resort has been working closely with the Wildlife Conservation Society (WCS) to help conserve the marine life in Ekas Bay. All of the building methods use sustainable materials. The wood is sourced from sustainable forests, coconuts and rooves are souced locally. 3 meals every day from the extensive a la carte Western and local menu with vegan and vegetarian options; All you can eat. Use of: Surfboards, stand up paddle boards, snorkelling equipment, bicycles, windsurfers and kayaks. Informative talks about environmental issues and the opportunity to help. Cultural tour: Local villagers share their homes with you, and offer a snack with the very sweet and strong Lombok coffee. – 3 meals every day from the extensive a la carte western and local menu with vegan and vegetarian options. All you can eat. 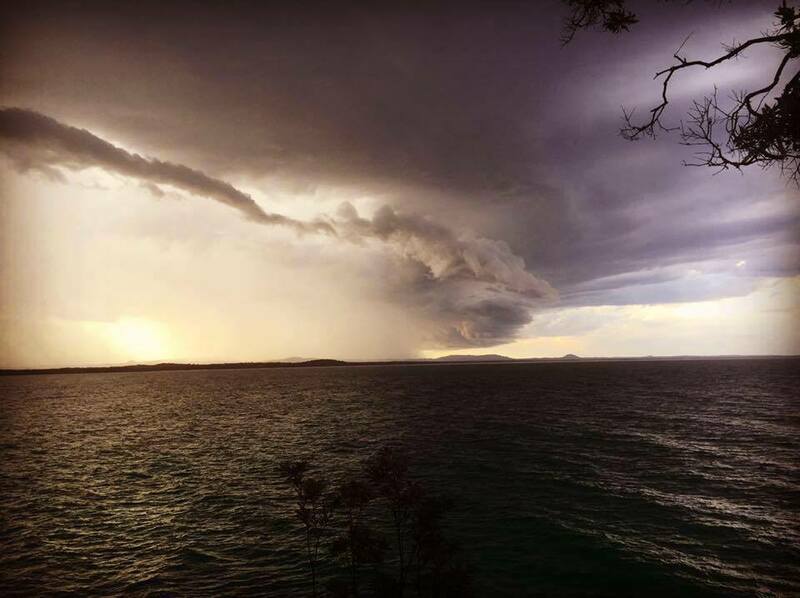 – Use of surfboards, stand up paddle boards, snorkeling equipment, bicycles, windsurfers and kayaks. – Informative talks about the environmental issue and the opportunity to help. – Cultural Tour: Local Villagers share their homes with you and offer a snack with the very sweet and strong Lombok Coffee. – DVD Players and DVDs. One communal television set with Indo vision. – Drinking water in your room. "Meditation is the instinct to savor life's beauty and wonder. The basic motion of attention is as natural as listening to music you love, gazing out over the horizon, or taking a deep breath as you smell something delicious." 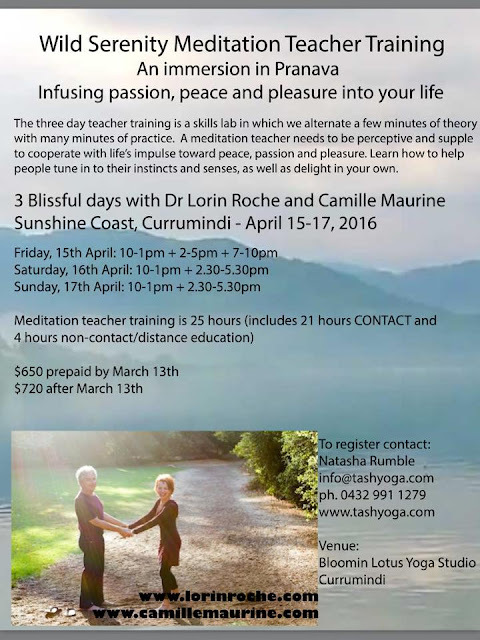 This is a weekend devoted to the skills of meditation and teaching meditation. 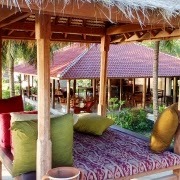 Choose from either residential retreat in 5 star beach side acommodation OR meditation immersion training only. All levels of experience are welcome. Nothing is forced; you can go at your own pace. This course is great for yoga teachers, counselling therapists, psychologists, school teachers, doctors of medicine, guidance officers, massage therapists/body workers, emergency workers, health care professionals, ... or anyone seeking to deepen their connection to their own life-essence. * Accommodation price is per person twin/double share room. Beach side, spacious , bright, 5 star luxury with swimming pool, direct beach access, stunning 360 degree views, access to kitchens ( 2 Kitchens). Healthy nutritous breakfast provided, all dietry needs can be catered for . Walking distance to cafes and restaurants, walking distance to lighthouse ,La Balsa Park and marina. Dr. Roche has been exploring, researching and teaching meditation since 1968, becoming a teacher of Transcendental Meditation. Over the years he has been developing an approach, which he calls Instinctive Meditation, that works with the fine structure of individual uniqueness, rather than imposing a standardized approach. He draws on insights into how people learn gained from the cognitive sciences, the Himalayan meditation tradition that TM is based on, Jungian dream work, and Tai Chi. This integrative approach results in simple ways for people to learn many different meditation techniques. Camille Maurine is the author of Meditation Secrets for Women and Meditation, 24/7, both written with her husband, Dr. Lorin Roche. A dancer and performing artist who has taught movement, meditation, and expression since 1975, she is the creator of kinAesthetics and the transformational Moving Theater process. Camille gives dynamic online trainings in women’s self-care and empowerment, and travels widely to give performances, workshops, and retreats. Camille Maurine and Lorin Roche give workshops and retreats together such as Wild Serenity, about enhancing self-awareness and intimacy in love, work, and play, and Luminous Being: Embodying The Radiance Sutras, Lorin’s poetic, sensuous translation of the ancient yoga text, the Vijnana Bhairava Tantra. Numbers are strictly limited! We want to keep this weekend training initmate so that you can get the most out of this immersion with two of the worlds greatest teachers in meditation. Additionally, we can only acommodate 8 people on the retreat. If you pay in full by October 3rd you will receive a discount. 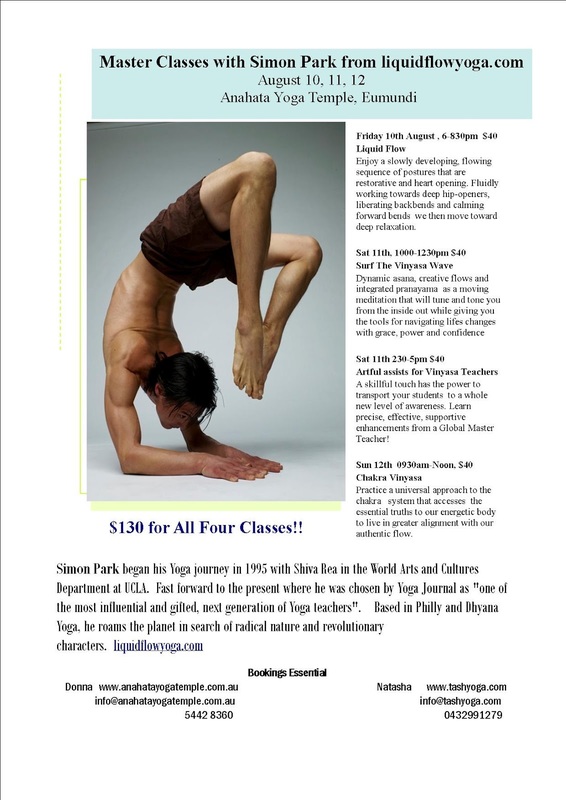 Contact me via info@tashyoga.com for direct deposit details . Private Pool, directly opposite beach access track to Buddina Beach, 2 mins walk to The headland aand Lighthouse of Pt Cartright. 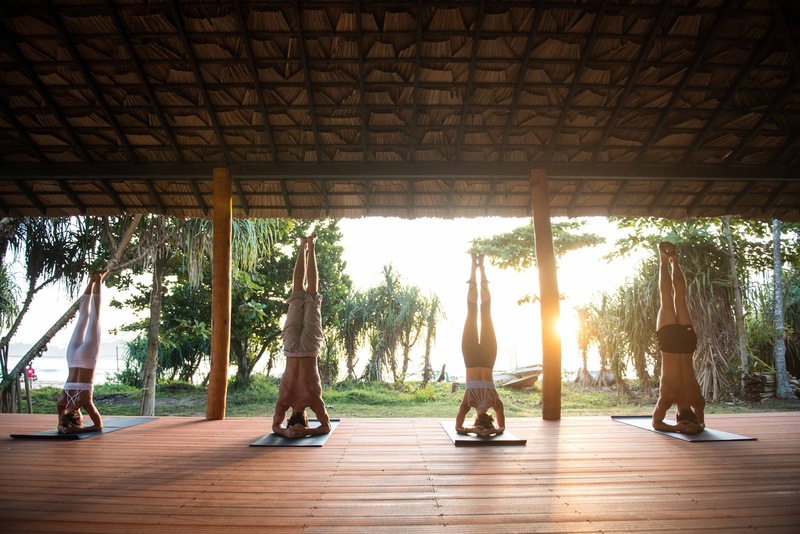 Daily Yoga, Meditation and Plenty of Beach time. Teas, fruit, snacks all day. Fresh, local and/or organic produce, wine with Dinner. 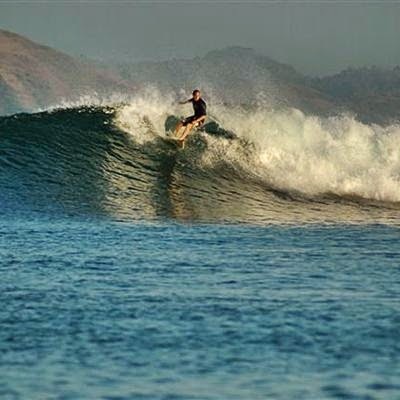 Surf Hire and Surf Lessons available. Kite Surfing Lessons available . Pay in Full by September 19th, 2014 and receive $50 discount!!! please reference your name , and let me know which class/classes you're attending. 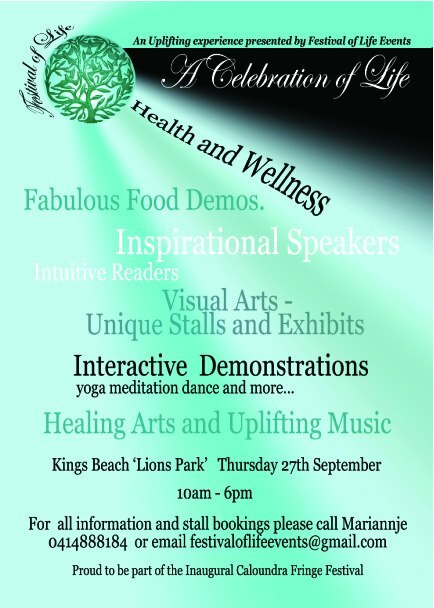 Tashyoga combined with The Yacht Club Inc.
present a series of yoga,meditation and cooking school sessions. 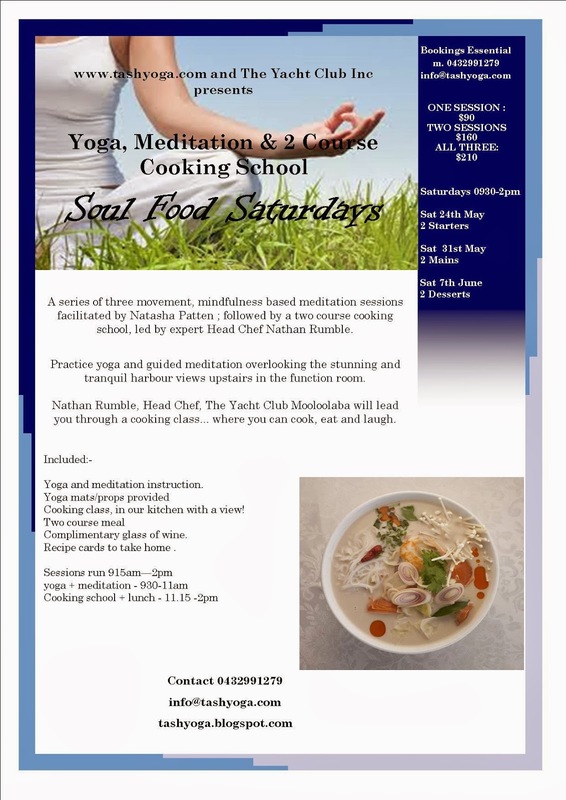 A series of 3 movement, mindfulness based meditation sessions facilitated by Natasha Patten , followed by a two course cooking school led by expert Head Chef Nathan Rumble. Practice Yoga and guided meditation overlooking the stunning and tranquil harbour views upstairs in the function room. Nathan Rumble, Head Chef, The Yacht Club Mooloolba will lead you through a cooking class... where you can cook, eat and laugh. 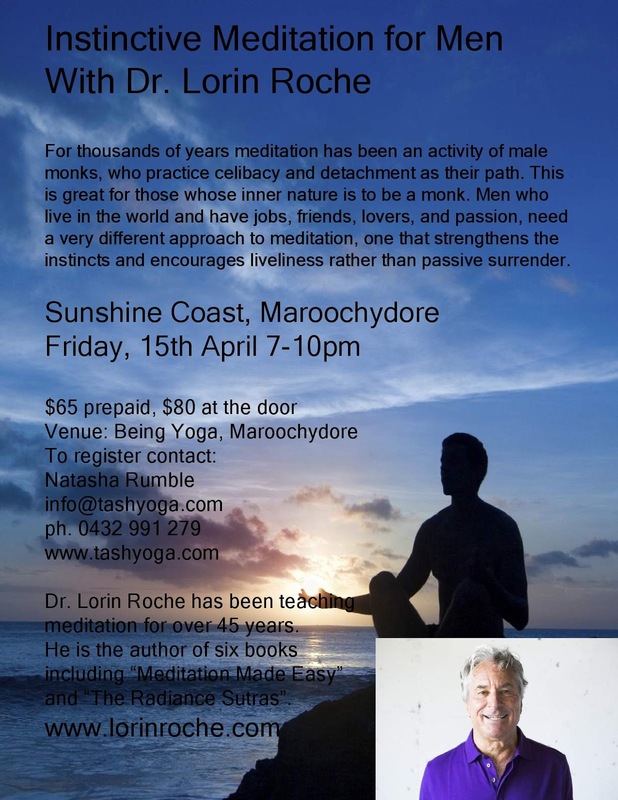 Special Guest Trudie Edwards from Sunshine Coast Power Yoga will offer an all-levels power yoga class followed by a Q & A session on wholesome eating. Trudie, owner of Sunshine Coast Power Yoga has raised 4 children wholistically, on organic nourishing foods. Trudie is an expert on preparing delicious and deeply nourishing foods that the whole family can enjoy. She will let you know the top ten must-haves in a healthy kitchen as well as anwser all your questions about superfoods, supplements and catering for special dietry needs etc. Two nights accommodation, ensuite in all rooms. 1 Workshop with Leanne - foods for optimal nourishment and nutrition - " Let food be thy medicine"
Discussion with Trudie Edwards - latest upto date info on food supplements, super foods, grain-free, gluten free nourishment. # nb there will be products for sale at retreat. As there will be no EFTPOS facilities, please bring cash. come with TWO friends and pay only $400 each. Couples/freinds will be given priority of room-share. contact tash asap for bookings/payment -numbers are limited. One of my fave places to flow!! In this fluid vinyasa class, we will move from the ground up, and work on axial extension to feel both strong and free. We'll strengthen our core centre, without getting all bunched up, rather feeling able to freely move through space with lightness, authenticity and joy. To be no longer striving for perfection, but instead striving for strength and freedom - thats true core-centered living. A longer, guided relaxation will help to deeply seal the qualities of your yoga practice into your entire whole being and integrate them into your life. Dates have been set for next years retreats!!! Stay tuned for more details on an Autumn and Spring retreat. Gift yourself with a refreshing and rejuvenating spring Retreat. 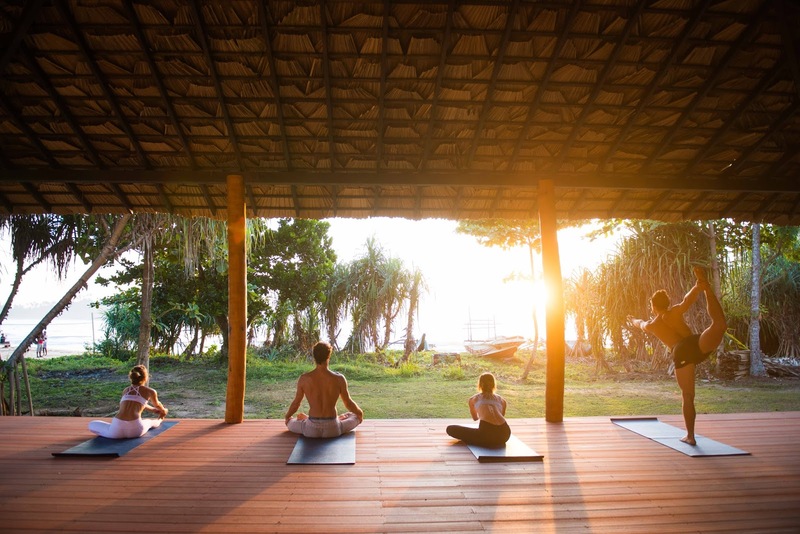 Retreats are an opportunity to meet new friends, enjoy peaceful, natural surroundings, feast on delicious vegetarian food, and nurture your body, mind and spirit with yoga. Relax, renew and recharge at this award winning venue. 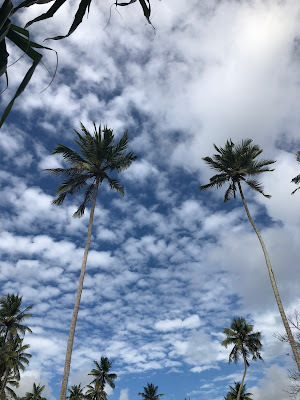 Allow yourself to detach and let go of the busyness of everyday life to reconnect with your inner beauty, calm and strength and then return back into the world feeling refeshed, renewed and recharged! Your financial investment for this opportunity varies depending on your room. $495 guarenteed own room with en suite. 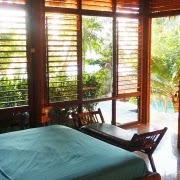 two nights accommodation in award winning ecotourist lodge. 4 yoga classes, two workshops, guided meditation and yoga nidra pratice. 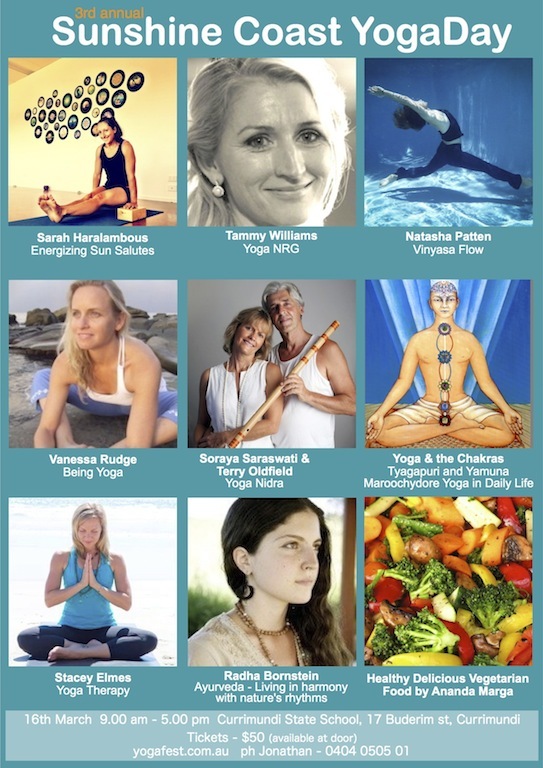 Tash Teaching At 2012 Brisbane Yoga Fest!!! Dive deep into your radiant heart and sweet mind with soulful flowing asana, uplifting musical vibes, and appleyoga’s signature structured alignment. This slow flow class is inspired by Katy's love for Vinyasa and Bhakti Yoga (the heart essence path) - weaved with mantra & divine poetry, introspective yin closing and resting deep in your bliss cells to complete the journey. Gifted Vinyasa Flow teacher Katy Appleton was a professional dancer for 10 years with the English National Ballet Company, and it was a natural progression for her from dance into yoga, some 12 years ago. 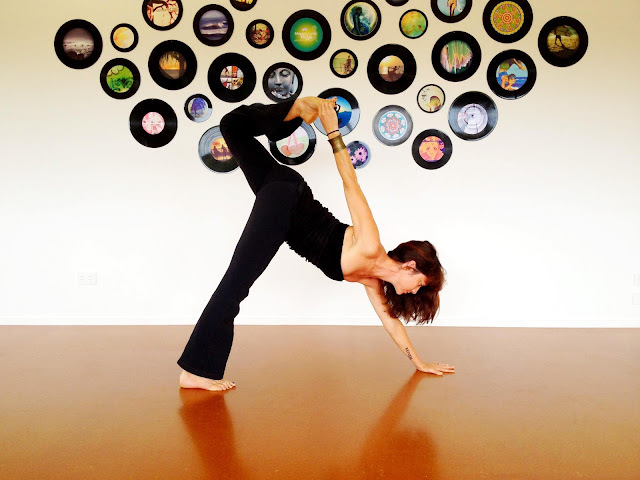 She has absorbed many styles, practices and forms of yoga and draws from them within her teaching. “Vinyasa Flow Yoga expands my entire being, it feels very much like dancing to me and takes me directly into the heart stream – Bliss!" Katy has studied extensively and still does with many of the most established teachers in the world, Shiva Rea, Eric Shiffman, David Swenson, Donna Farhi to name just a few. She has written 2 yoga books and has created & featured in many yoga DVD's - the best known, Geri Yoga back in 2001. Katy is the Director & Founder of appleyoga, offering group classes based at different locations throughout London, as well as life changing retreats and workshops in beautiful locations around the world. Katy also heads up appleyoga Teacher Trainings, currently offering 200Hr YA Registered TTC, Pregnancy & Postnatal Yoga TTC & appleyoga Foundations. "The word that comes to mind when thinking about Katy Appleton's workshop is 'Wow!'... 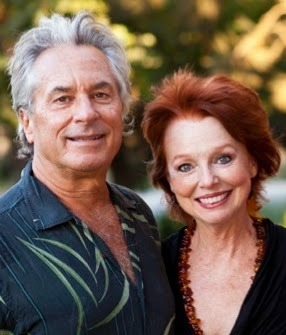 she is a vibrant, energetic person whose love of life and yoga shines out like a bright light." "Katy is unique in her ability to make yoga so enjoyable.."
"Katy is a breath of fresh air, physically, mentally and spiritually... I love her." * Basic rooms may have share bathroom with one other person. 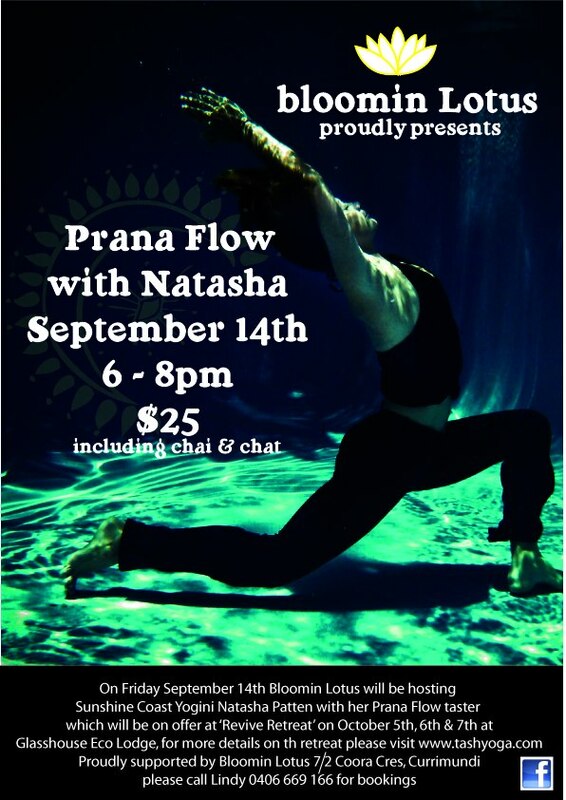 Tash will be leading a pranaflow class representing Soul Song Yoga Products. 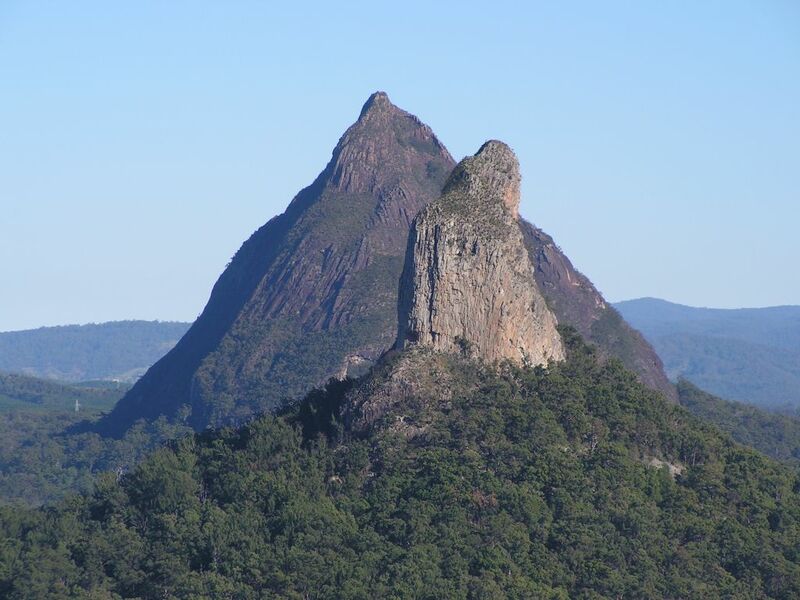 Nice blog and i get many helpful information bout the Counselling Sunshine Coast it's good one. Thanks for sharing very helpful information. I found another Yoga Meditation, site , they provide very helpful services. An accredited program will also include a number of hours on instructing you on teaching methodology.